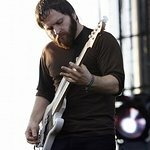 Nick is a member of Death Cab for Cutie. Harmer has lent money to small business owners through Kiva, and speaks highly of the experience. Nick has taught at 826 Valencia, an organization which helps children ages 6-18 develop their writing skills. Google trends for "Nick Harmer"
We don't have any videos related to Nick Harmer.